The Matobo Hills is one the last places in Africa you can see both black and white rhinos. There are around 5,000 black rhinos in the wild and they are classed critically endangered. Whilst the populations of the white rhino are larger, they are still considered near threatened. Any sighting of a wild animal in its natural environment is special, but the scarcity of these species makes this encounter all the more poignant. Your adventure begins with a 4x4 drive in search of the rhinos, aided by the knowledge of your driver and guide. Once in the vicinity of the animals you alight and set out on foot. Any walking safari in the bush is an intense experience, as your senses go into overdrive and you anticipate possible encounters, and you are glad of the calming presence of your guide. Nothing can quite prepare you for the sight of a full grown adult rhino just metres away. It will take your breath away, literally, for a few moments. Each sighting is different, you may come across an individual, a group, or a mother and calf, and all are equally thrilling. In Matobo Hills National Park just south of Bulawayo, which has relatively high densities of rhinos. 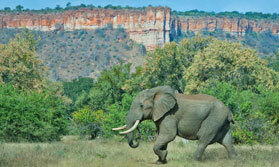 Rhino tracking is offered all year round. Rhino tracking is among the activities offered during a stay at Camp Amalinda.